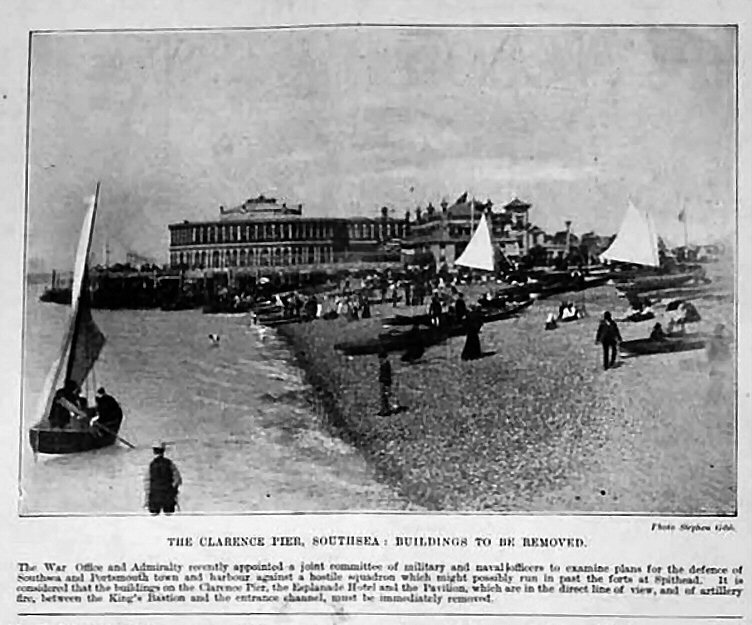 From the Illustrated London News 2nd May 1896. 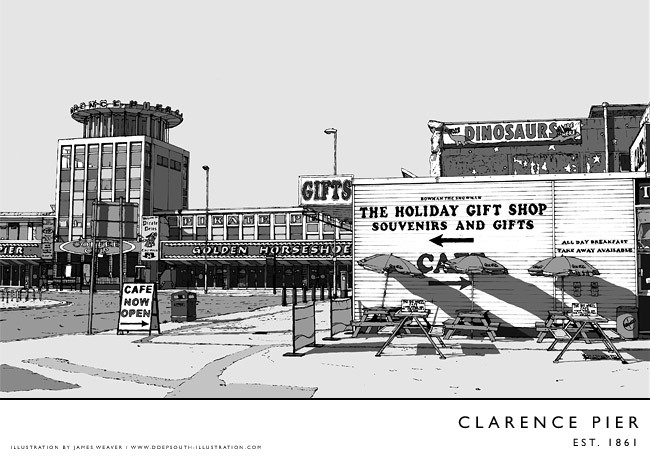 ---- THE CLARENCE PIER, SOUTHSEA : BUILDING TO BE REMOVED. 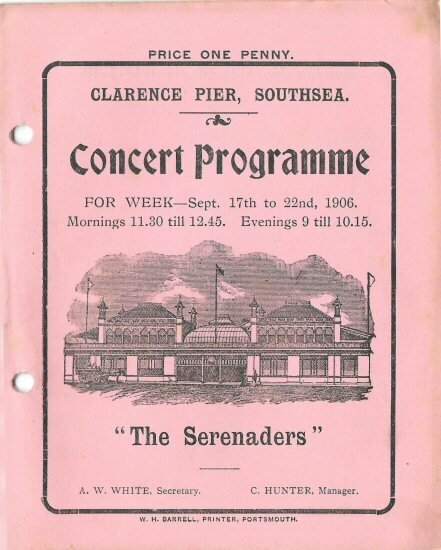 The War Office and the Admiralty recently appointed a joint committee of military and naval officers to examine plans for the defence of Southsea and Portsmouth town and harbour against a hostile squadron which might possibly run in past the forts at Spithead. 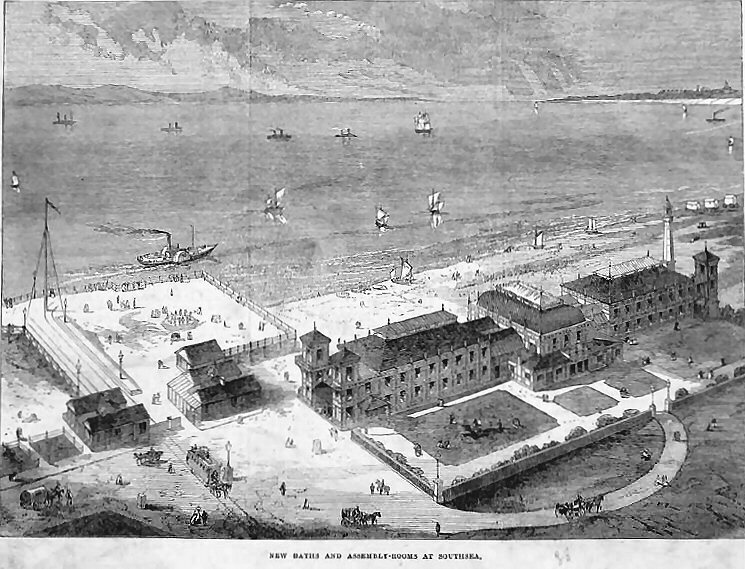 It is considered that the buildings on the Clarence Pier, the Esplanade Hotel and the Pavilion, which are in direct line of view, and of artillery fire, between the King's Bastion and the entrance channel, must be immediately removed. 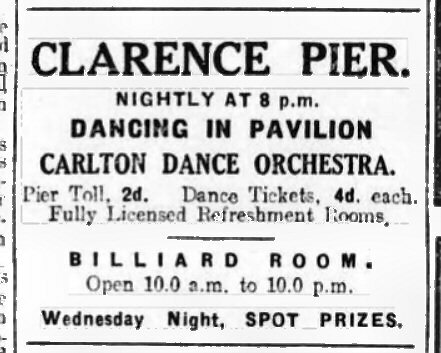 The Carlton Dance Band, date from the mid 1920's. 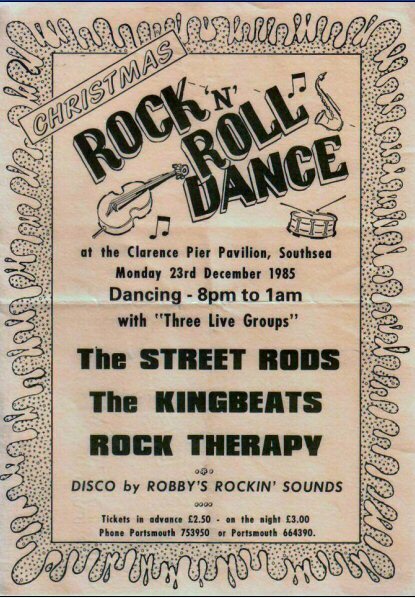 The venue was the Clarence Pier, Southsea. 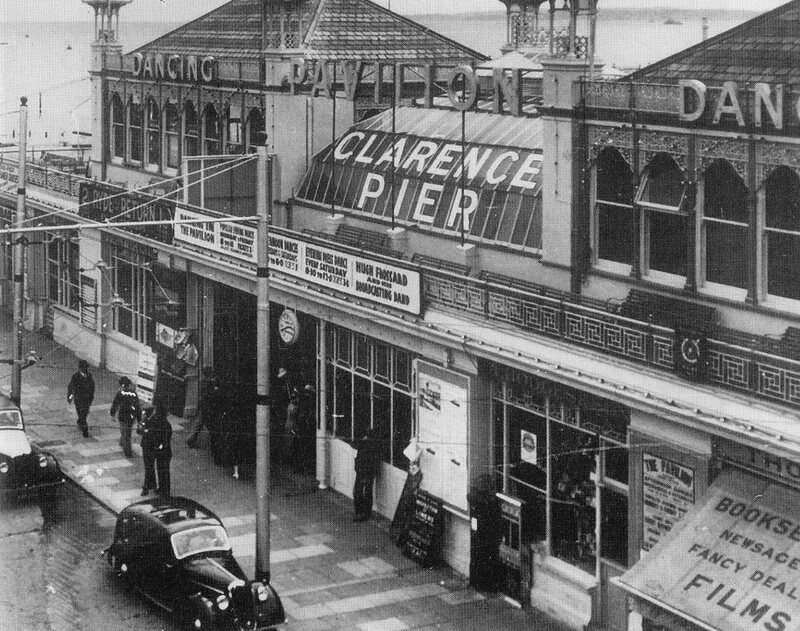 Southsea's original pier, the Clarence Pier, is now a complete contrast to the resorts later pier that was built at South Parade. 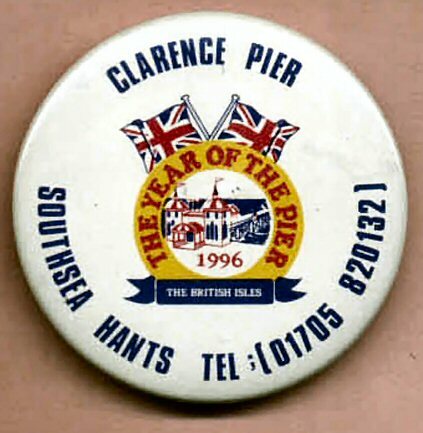 Most people visiting Southsea Clarence Pier would probably not even realise the complex were in fact a pier, if it wasn't for the name. Its history is also a tale of two contrasting halves. 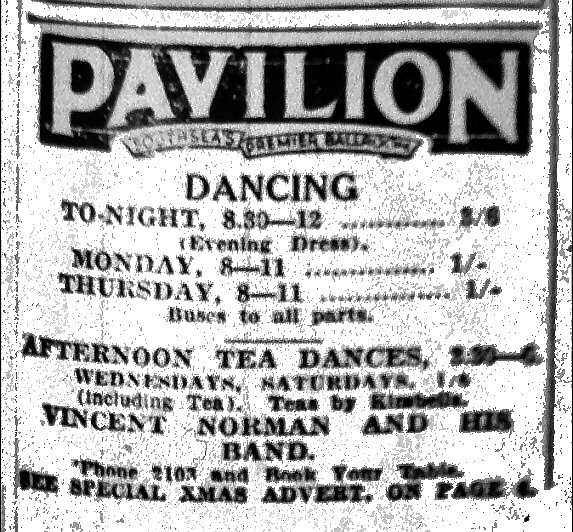 Firstly the elegant pavilion pier, so typically Victorian in style and opened by a future king, to be replaced by a post-war amusement complex, bold and brash, in equally typical 'kiss me quick' style. 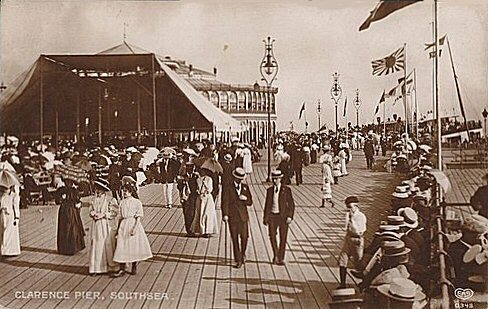 Building commenced on Southsea Clarence Pier in 1860, opening to the public for the first time on 1st June 1861. 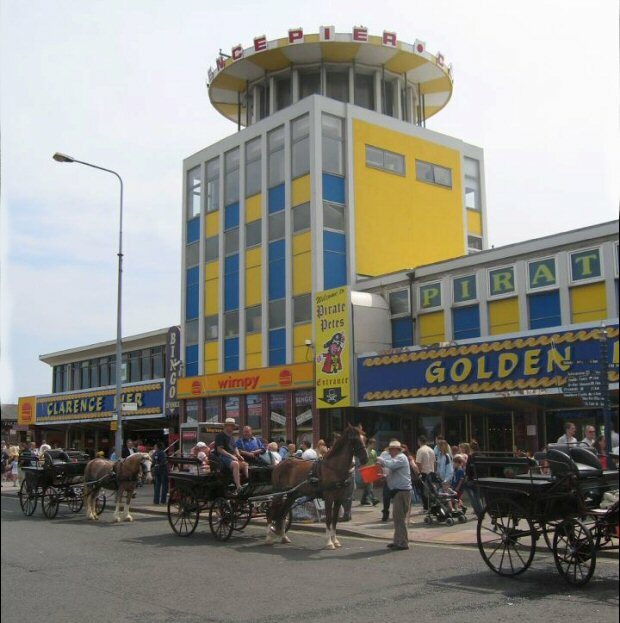 From 1866 the Landports Southsea Tramway ran directly to the pier, being superseded by the Harbour Railway Station in 1873. 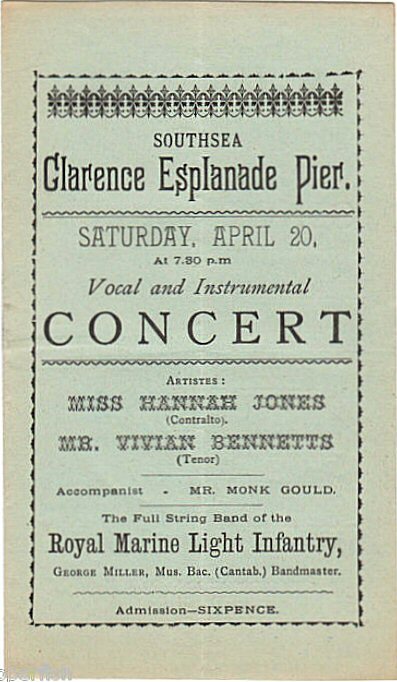 In 1874 Southsea Clarence Pier unusually became the centre of a local dispute when the operating company attempted to block access to the beach, between the pier and the nearby Esplanade Hotel. 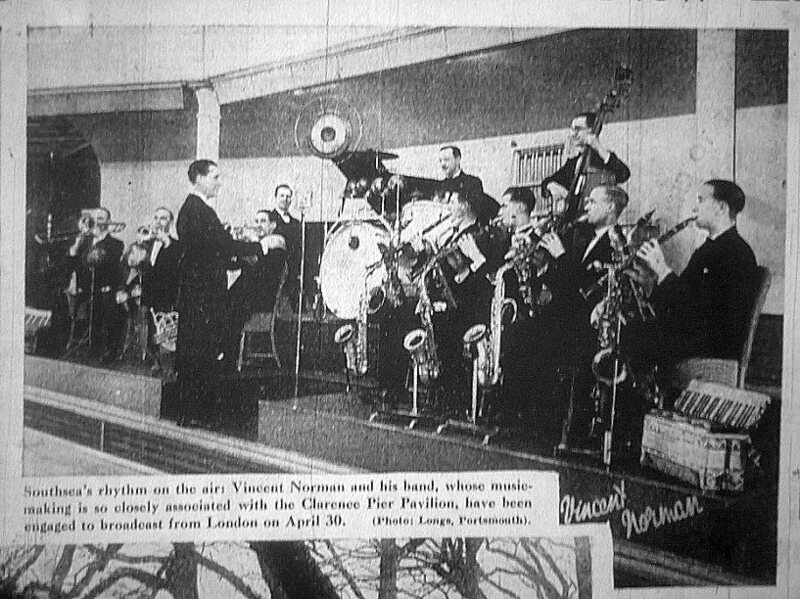 A crowd of local protesters, led by one Mr B Miller, broke down the offending barriers, burning them on the beach. 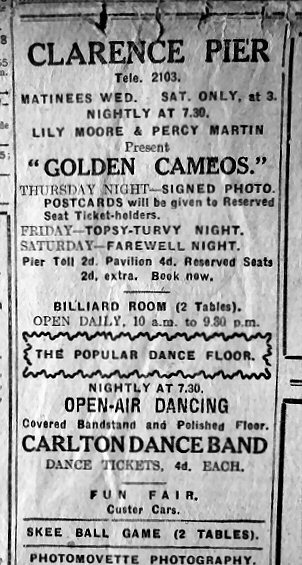 Southsea Clarence Piers most striking addition, the stylish octagonal pavilion, was opened by the Prince of Wales (later to become King Edward VII and Queen Alexandra) on the Monday opf the third week in August of 1882, marking the last development of the pier until the turn of the new century.Madame Adalina Patti (Sopprano) the 'Queen of song' attended the opening concert. 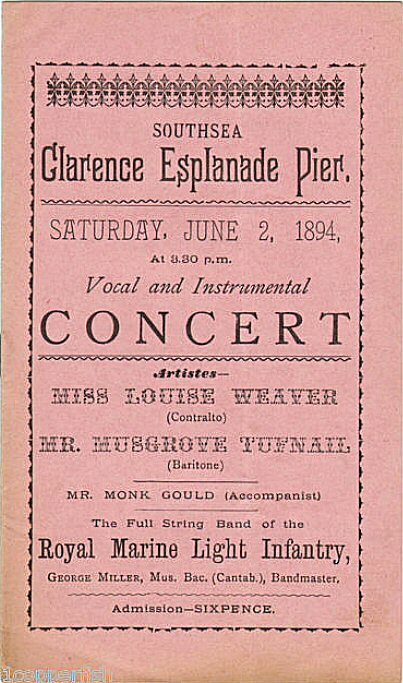 She sang "The Cuckoo" and "The Nightingale". She was then 39 years old . She died 27th September 1919. 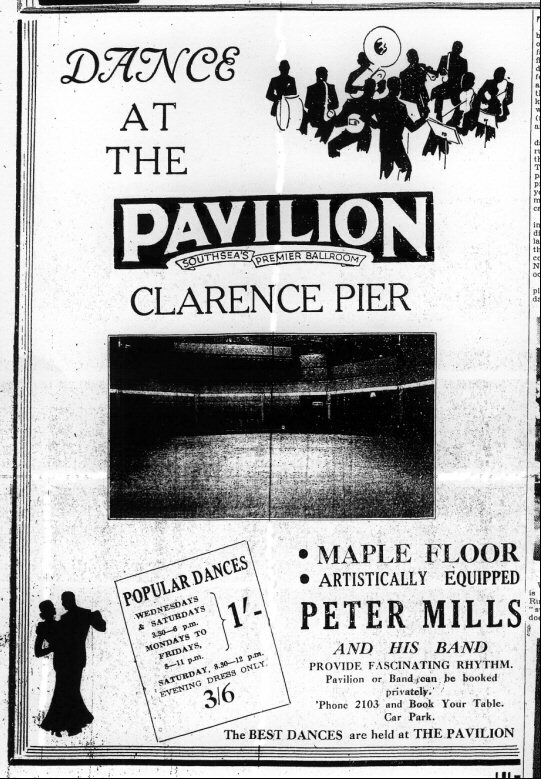 Increased steamer traffic to the resort prompted the Pier Company to build a concrete extension in 1905, and further work in 1932 saw the addition of a new café, sundeck, shops and a concourse hall. 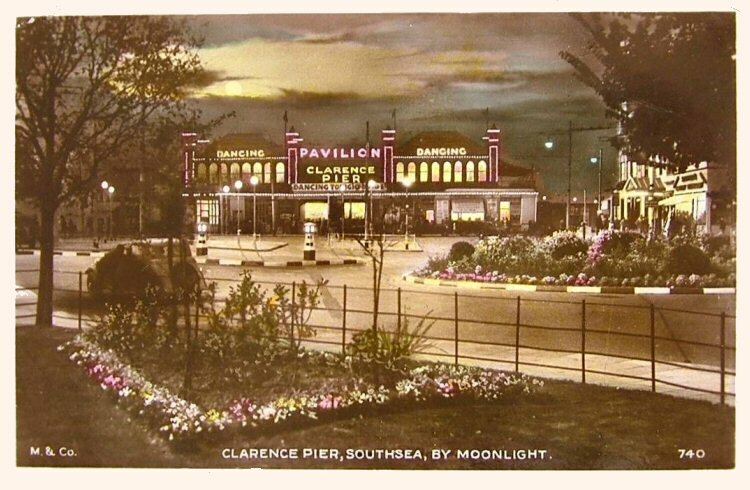 It was during the Second World War that Southsea Clarence Pier was to suffer its saddest hour, and the country was to lose one of its great Victorian legacies. 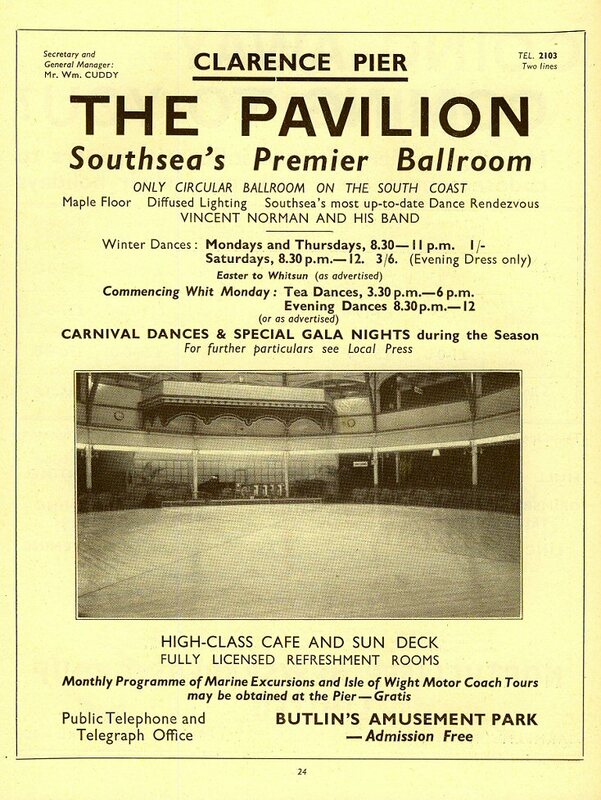 Being in such close proximity to the large ports of Southampton and Portsmouth, the Southsea resort was always vulnerable to attack and, on the night of 10th January 1941, Southsea Clarence Pier was hit by German bombs and totally destroyed. 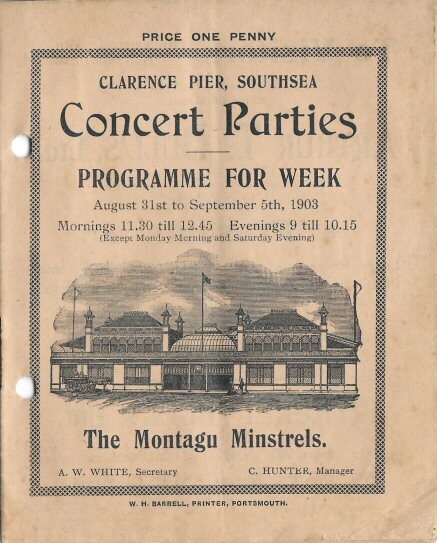 Re-building of the pier didn't commence until 1953 when the first pile of the new substructure was driven in, the work continuing for a further six years. 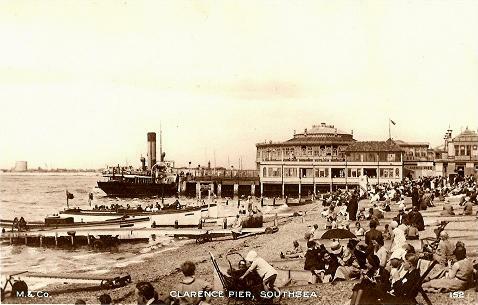 Unlike all other piers, Southsea Clarence Pier is unique in the fact that it runs along the beach rather than out to sea, making the whole structure much wider than it is long. 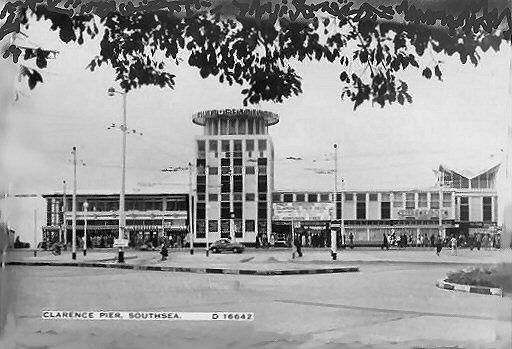 In 1959 work got underway on the superstructure featuring the 60ft (18m) steel tower that still dominates the site today. 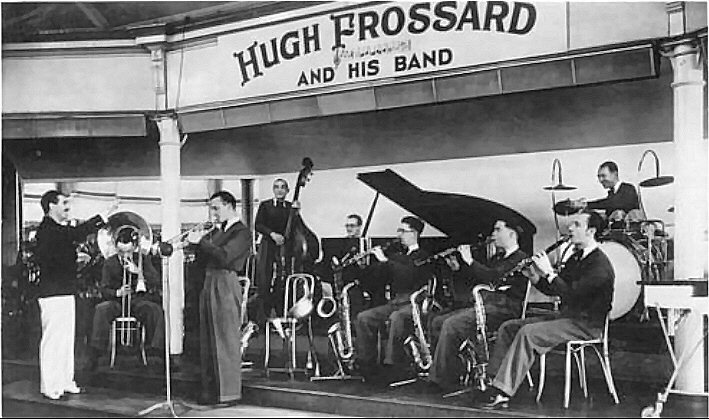 Messers A. E. Cogswell & Son's, in association with local architects R. Lewis Reynish, designed the superstructure at an estimated cost of £250,000. 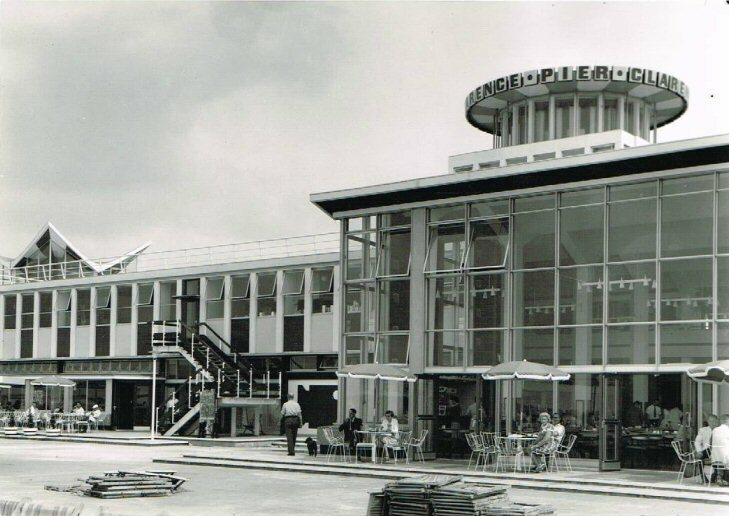 Mouchel & Partners designed the deck and landing stage. 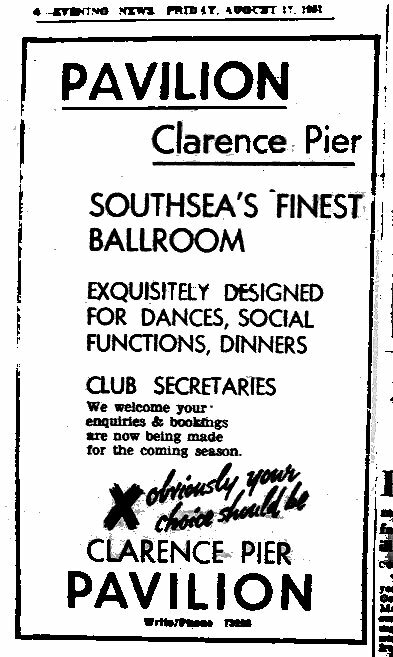 Work was completed on the Southsea Clarence Pier ready for opening on 1st June 1961, exactly one hundred years to the day since the original pier was opened. 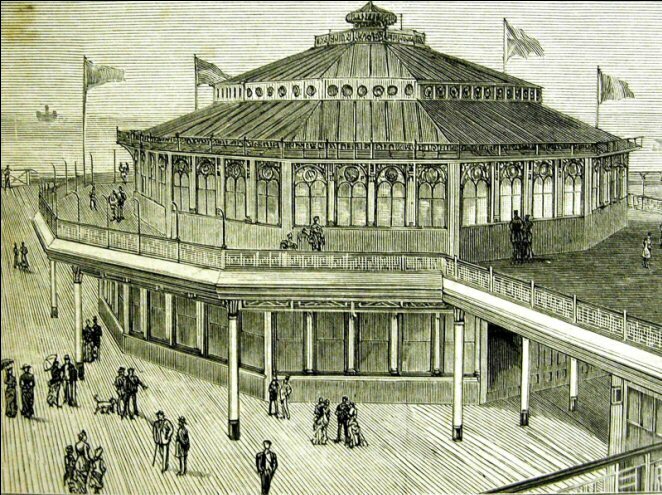 Work on the pier commenced in 1860 and it opened on 1st June 1861. 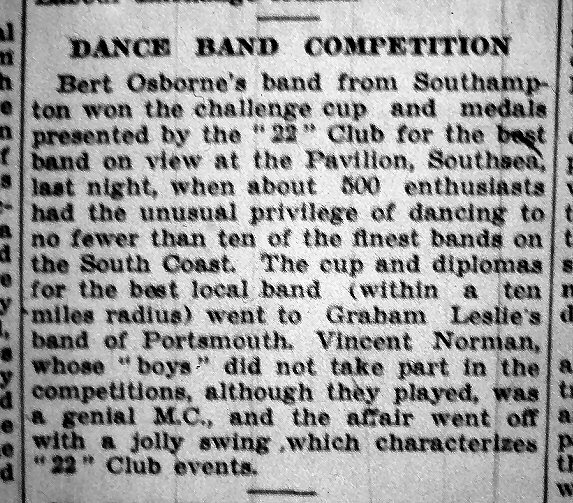 From 1866. 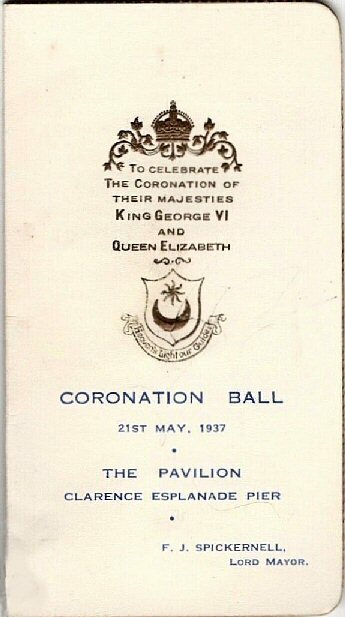 The Prince of Wales (later King Edward VII) opened the pavilion in August 1882 and, in 1905, a concrete extension was built to accommodate increasing boat traffic. 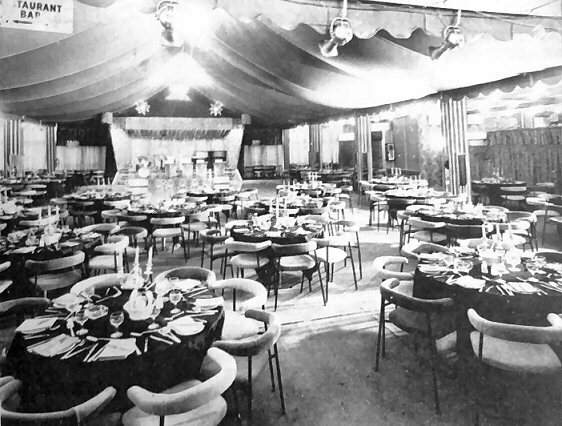 In 1932 a new cafe, sundeck and concourse hall were built along with shops on the front. Bombing destroyed the pier on 10th January 1941 but in 1953 the first pile of the reconstructed, lower structure was driven. 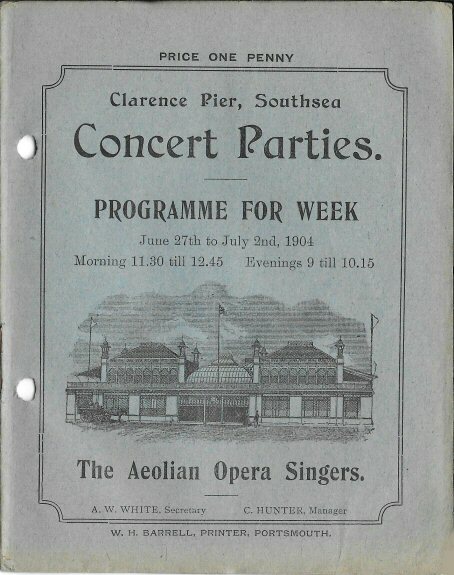 Six years later, rebuilding of the superstructure began to the design of Messrs A.E.Cogswell & Sons in association with Portsmouth architects R.Lewis Reynish. This was set to cost an estimated £250,000. 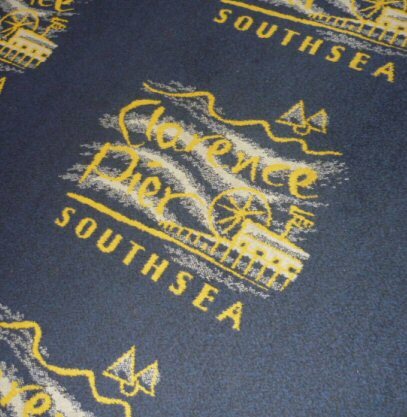 Mouchel & Partners of London designed the deck and landing stage. 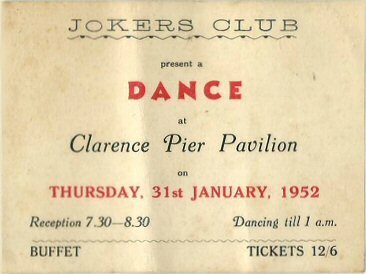 Clarence Pier, featuring a 60 foot steel-framed tower, re-opened on 1st June 1961. The pier is unusual in being a lot wider than its length. 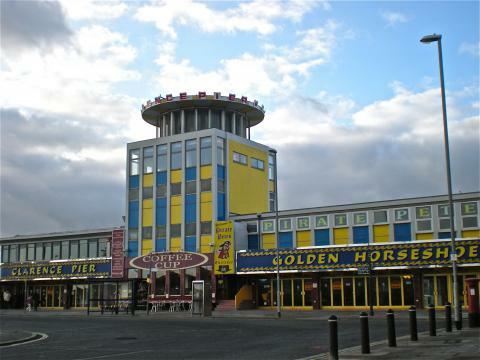 Facilities included indoor complexes (such as Pirate Pete's Adventure Playground, arcades, and ten-pin bowling), and outdoor fairground attractions including a roller coaster, big wheel and a monster express train. 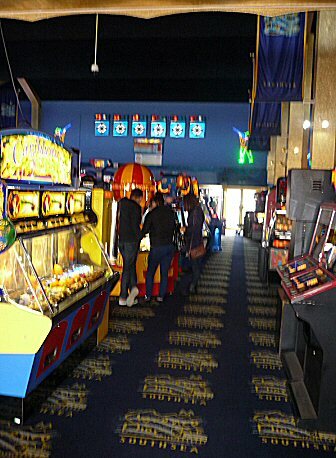 There were also various fast-food outlets, and an ice-cream parlour. 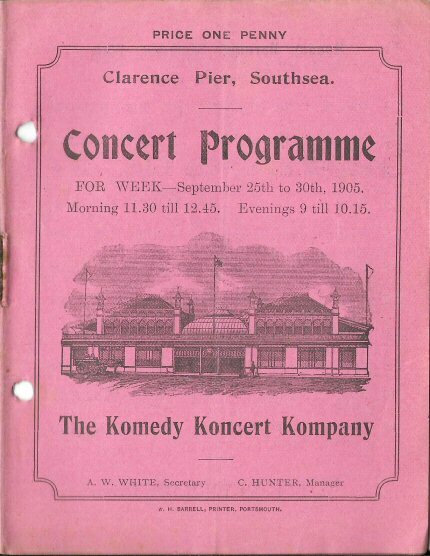 These have been added to and updated over the years and the pier remains an extremely popular attraction, having been billed as 'the largest amusement complex on the south coast'. 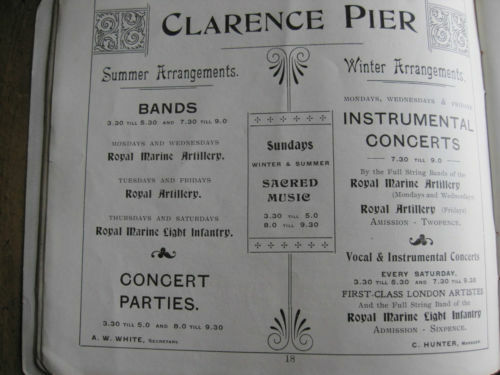 The original Clarence Pier was built in 1861, and was opened by the Prince and Princess of Wales who attended a concert given by the combined band of the Royal Marines Artillery and Royal Marines Light Infantry. 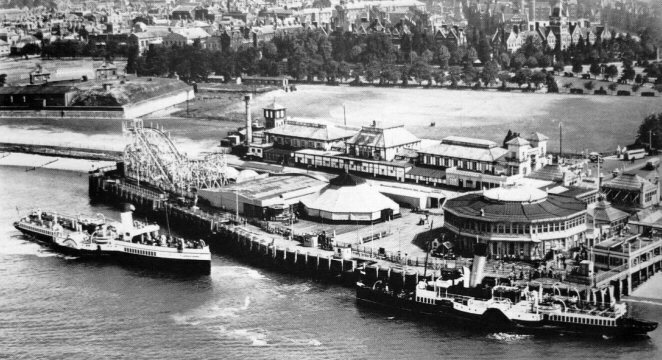 Up until 1873 the Pier had a tramline from Portsmouth Town Railway Station (now Portsmouth & Southsea) which ran right onto the Pier, taking passengers and luggage to the Isle of Wight on steamers. 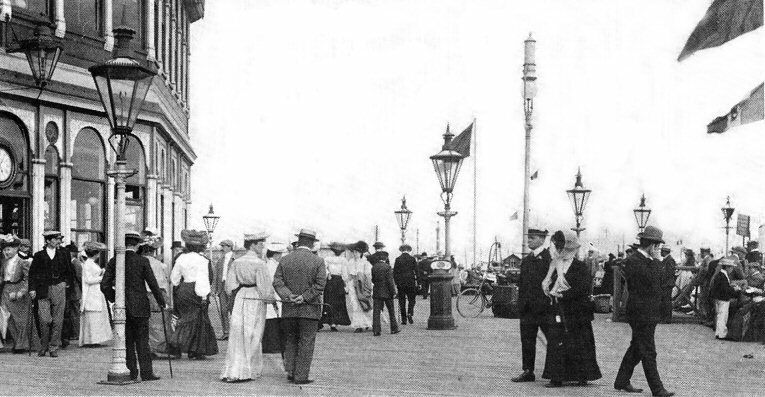 In 1905 the Pier was extended to accomodate increased boat traffic. 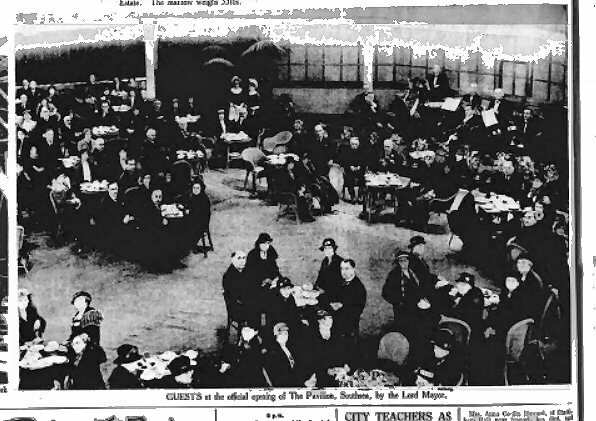 Further extensions were made in 1932 when a café, sun deck and concourse hall were added. 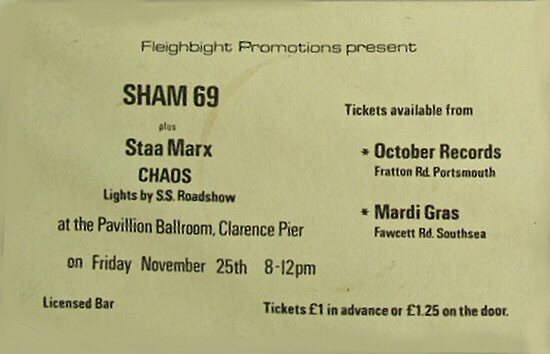 Then on 1st June 1941 the Pier was bombed by the Luftwaffe during the heaviest air raid on Portsmouth of World War Two. 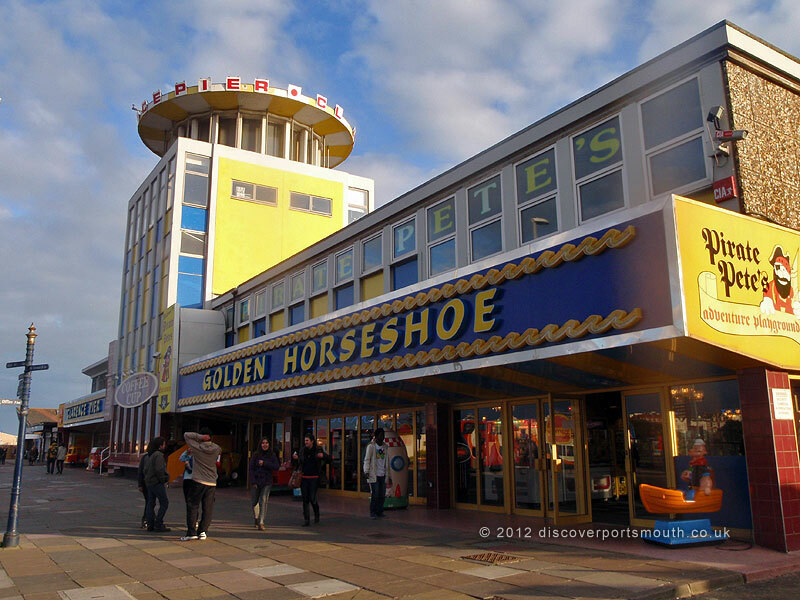 It re-opened in its present form some twenty years later on 1st June 1961; the Pier with its funfair has been synonymous with Southsea, it boasted favourite concert parties and shows, and ever-changing rides, slot machines and video games etc. 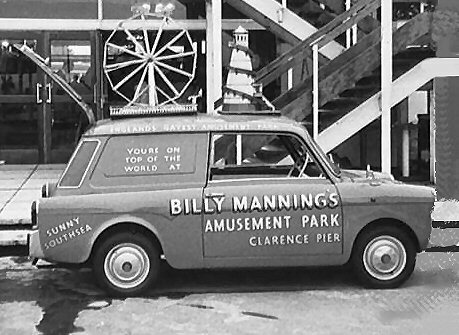 For most visitors, their favourite memory of the Pier is the laughing sailor machine which stood outside. For a penny you could make him split his sides. The original machine has been preserved, and recently restored. 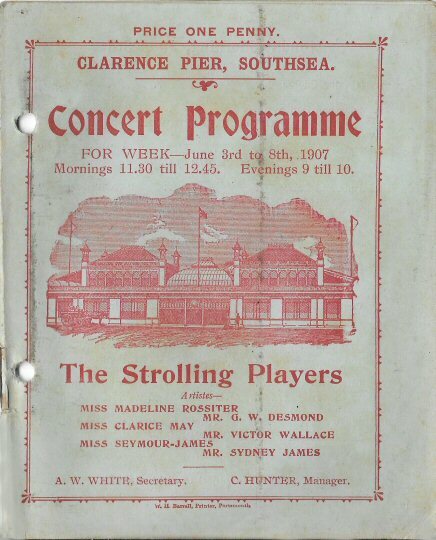 It is now held in a collection maintained by the pier's current operators. 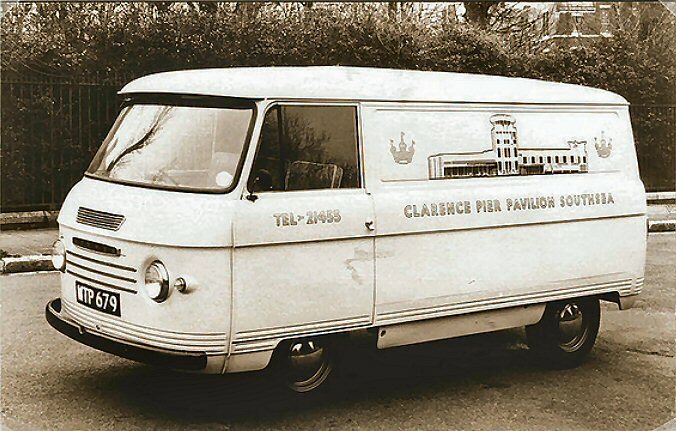 "Mind The Baby, Mr Bean", an episode of British TV comedy series "Mr Bean" was filmed on location at Clarence Pier (as well as other locations in Southsea). 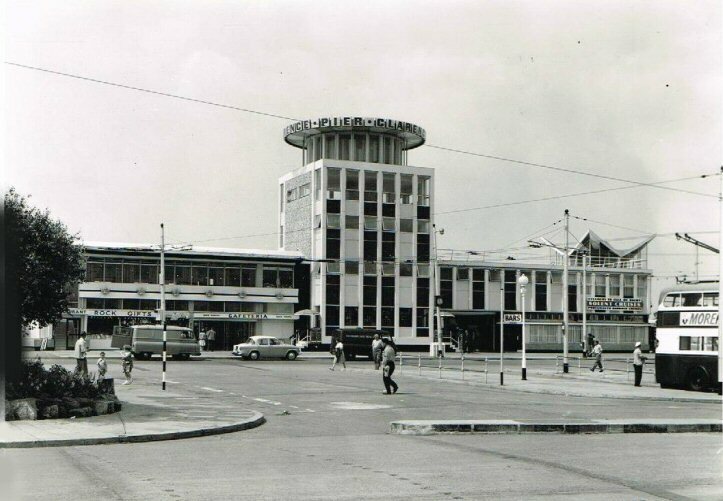 This was prior to the closure of the North Western part of the park and the closure of the Wheel Of Fortune public house. 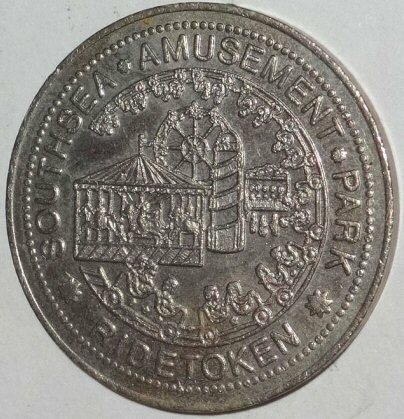 The episode shows the Super Loop, Skyways roller coaster, and many of the park's other attractions from that time. 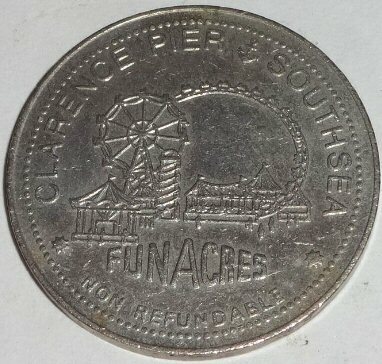 Clarence Pier was also the filming location to the teen pop band, "S Club Juniors" song, "Fool No More" filmed mainly on the dodgems but the rollercoaster, 'Skyways' can also be seen in the video. 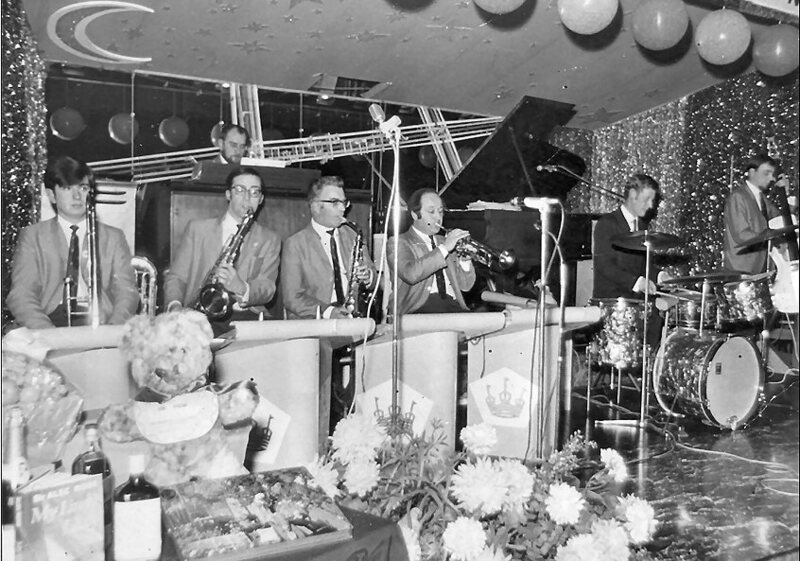 In the early 1960's the resident band was the Eric Galloway Orchestra. 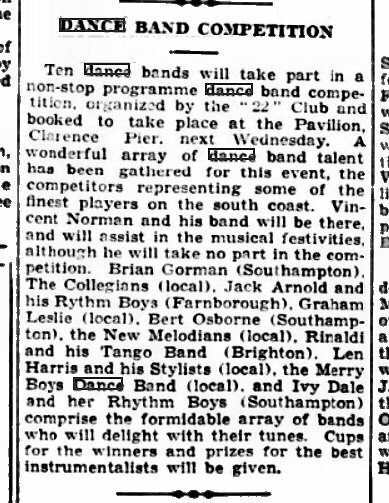 About 1963 that changed and Arthur Ward brought his band to the Pier, at first with singer Mike Devon, and later Mick Reeves. 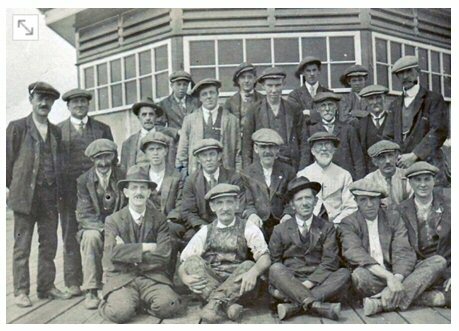 Mike Jones, of Telford Road, North End, Portsmouth, who sent this photograph of his grandfather, Ernest Humby and fellow workers on the pier. 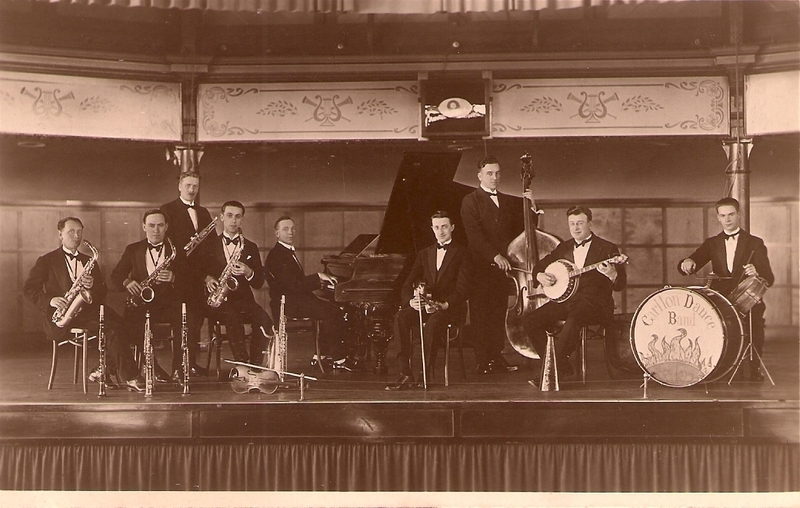 He and his brothers were painters and decorators in the city for many years and here is Ernest (kneeling on the left hand end of the front row and wearing a trilby) surrounded by his workmates. 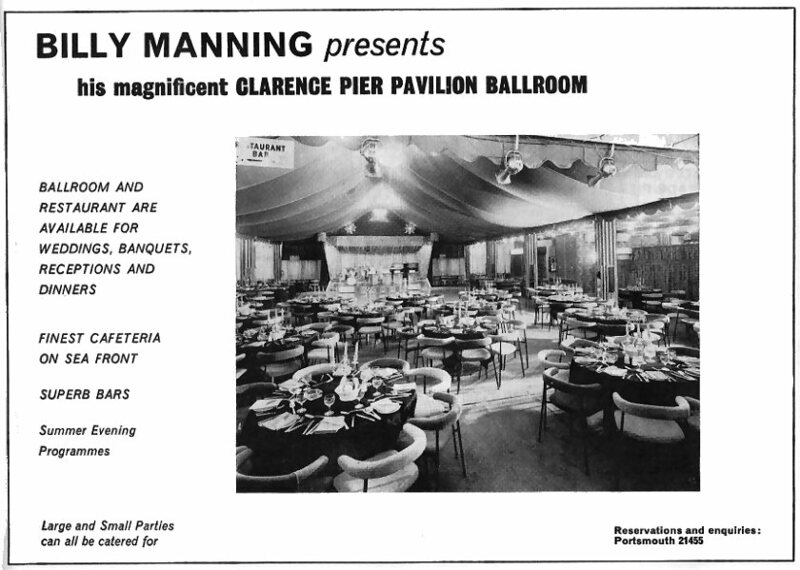 and the Clarence Pier Pavilion and the Espanade Assembly Rooms and Hotel were no more. 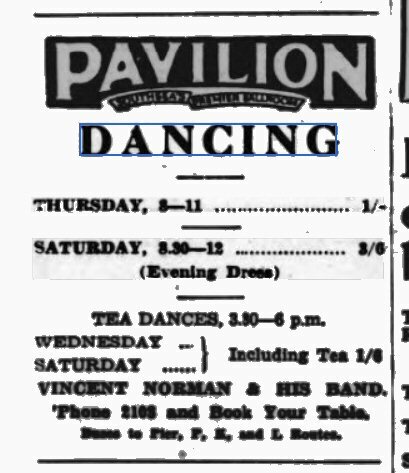 1909 November 13th Book of Words, Mr Albert Archdeacon, Miss Nora Meredith. 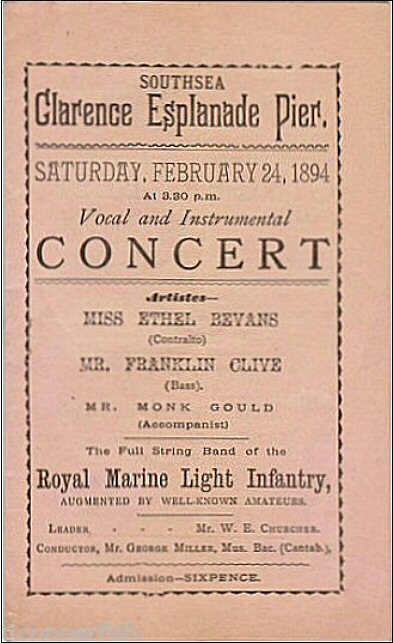 1909 November 20th Miss Dilys Jones (The Welsh Contralto), Mr Cynlais Gibbs (The new Welsh Tenor). 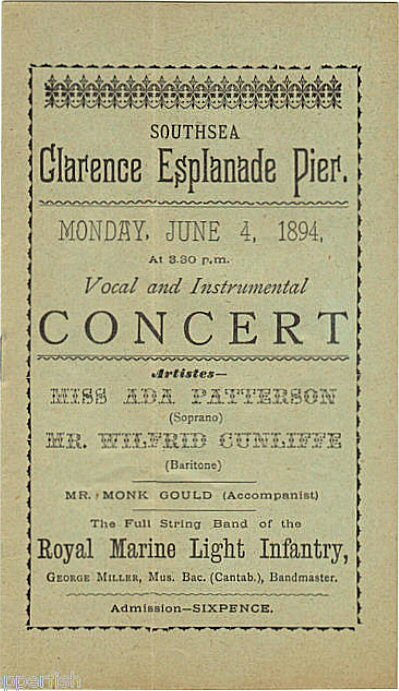 1909 November 27th Miss Mabel Manson (The New Zealand Soprano), Mr Charles Tree (The Popular Baritone). 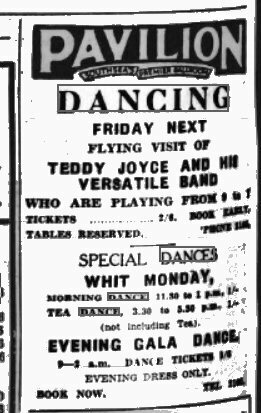 1935 Summer Season Speedtime First class London Artistes. 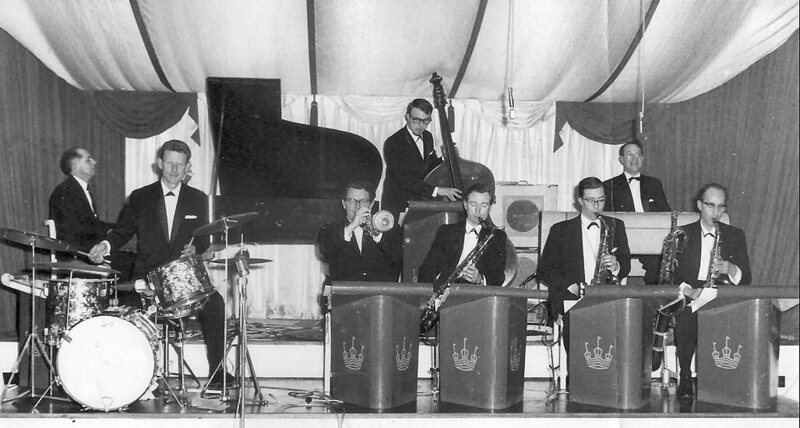 30/1/1965 Artur Ward and his Orchestra featuring Mike Devon, The Casuals. 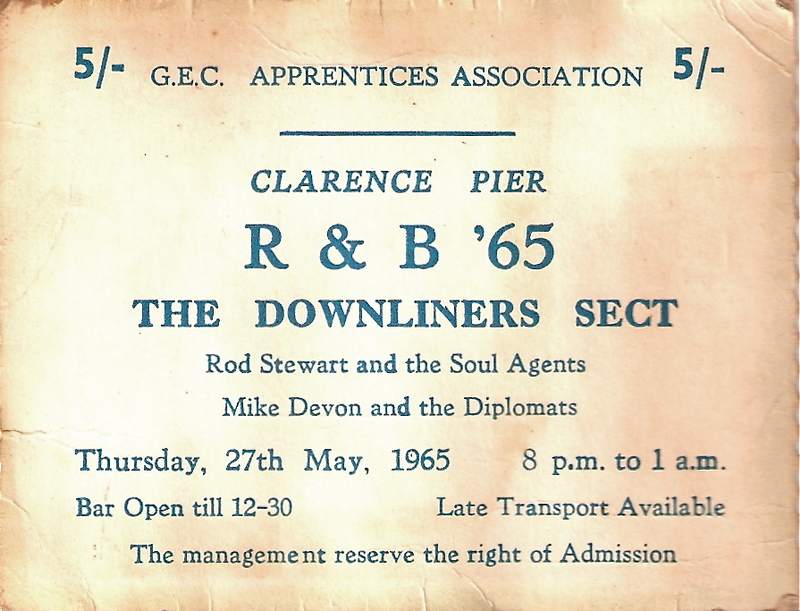 Thursday, May 27, 1965: 'R&B '65', Clarence Pier, Clarence Esplanade, Southsea, Hampshire Also on the bill: The Downliners Sect, Mike Devon and The Diplomats. One show, from 8:00pm to 1:00am. 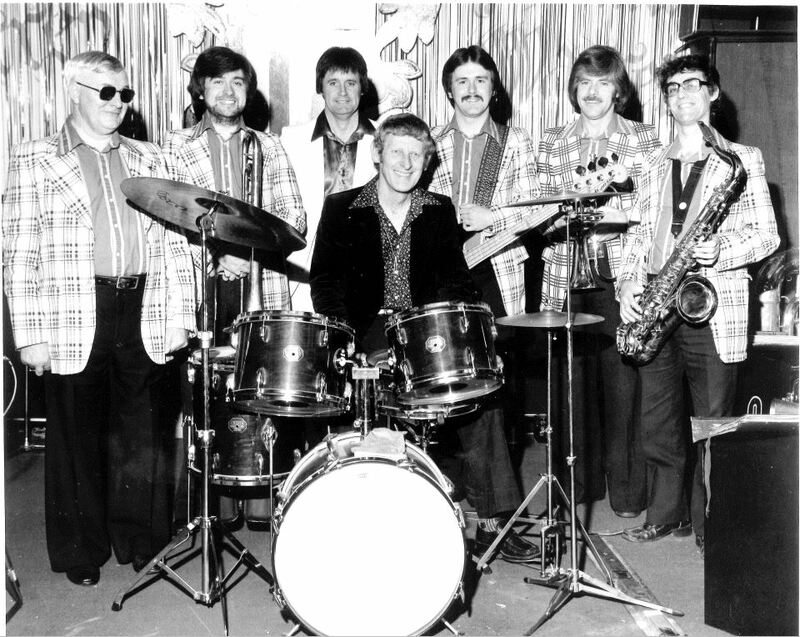 Right after their performance, The Soul Agents returned home, while Rod Stewart went across Southsea Common to the recently opened Birdcage Club at Kimbells Ballroom on Osborne Road, and sat-in with The Brian Auger Trinity. 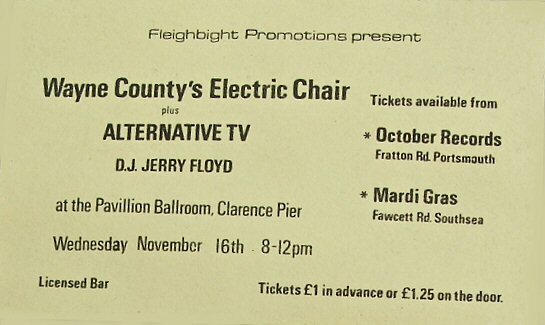 1969 February 6th for the College of Education The Fortunes, Heaven. 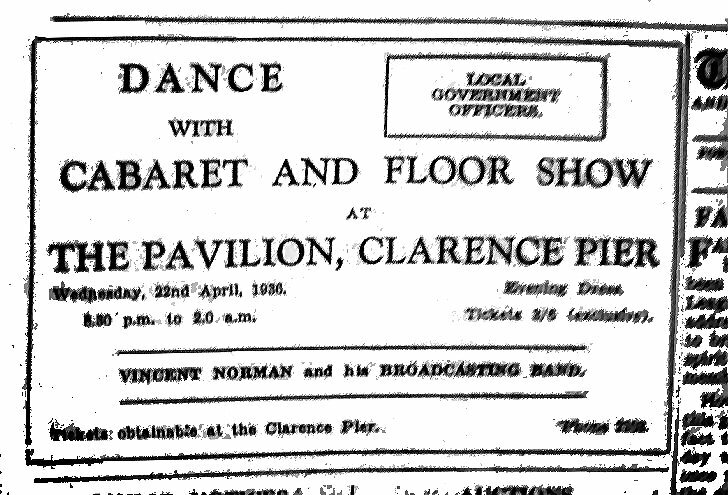 As Clarence Pier is today.